Fifteen years ago, there were only a few Alpine Slides in Colorado; today they are an international sensation. What is an alpine slide? Picture this: a three foot diameter PVC pipe split in half that snakes its way down a mountainside. You drive a sort of snow sled on wheels down the track with a handle to brake and gravity to accelerate. An alpine slide is the summer version of a luge. With average speeds of 20 miles per hour, the half mile track provides a great ride that is far from quick. While alpine slides have exploded in popularity and locations, our favorite is the one where I first experienced the thrill, located in the beautiful mountain town of Breckenridge, Colorado. Breckenridge Mountain, a member of Vali Resorts, is home to a summer fun park at the base of its Peak 8 were there are many summertime activities including the Alpine SuperSlide, mini golf, and rock climbing. This is a great location for a one day getaway or a mid-summer vacation. They have three tracks which run side by side. One is for those who want to go slower, and the other two offer the opportunity to go faster as well as race your kid. (Dads with younger kids can place a child in between your legs to experience the thrill together.) While somewhat expensive, one or two rides usually pack more than enough excitement for most patrons, and leave you wanting to come back for more. In this clip, you’ll see some GoPro action shots as well as see Alex take a page from his Dad’s playbook. Ten years ago, I flipped my cart in a turn as I was trying to beat my brother. This time, it was Alex who took the flip while we were racing each other. Make sure to watch the camera picture turn upside down as he flies through the air. Paralleling my experience ten years ago, we had to visit the medical center to remove the chards of fiberglass in his wound. That part’s not much fun but gives you even more to reminisce about with this adventure. Unfortunately for Alex, he will have to wait until next year to beat his Dad down the mountain! To experience an alpine slide yourself check out the Breck Summer Fun Park at http://www.breckenridge.com/info/summer.aspx#activities#top. Breckenridge not in your area? Here’s a list of alpine slides in other states and even other countries! Every summer, for the past 5 years, Alex and I have tried to make it out to Bandimere Speedway in Morrison, Colorado. In addition to being a race track for high speed dragsters, they offer one of the best high speed Go-Kart tracks in the metro area. Action Karting, while not inexpensive, offers a great experience every time we have go. Their 6.5 HP Go-Karts produce speeds of 55MPH on a half mile track. 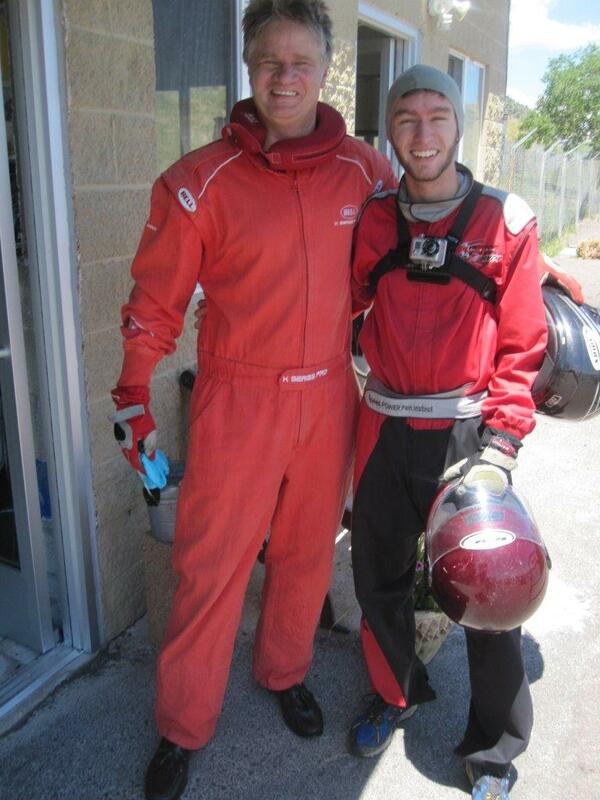 Nothing brings out your competitive nature like putting on a racing suit and helmet. You can almost fantasize about being a NASCAR driver! While we discovered this sport when Alex was 13 years old, there are plenty of dads taking their younger children out. They have smaller kid’s carts and they do a great job trying to separate groups with younger kids from the teens and adults who are looking for maximum speed. After suiting you up in a fire suit and helmet, course instructors put you through a ten-minute training on the rules of the track and how to keep yourself safe. Unfortunately for Alex, he got distracted with his buddy the first time we went and didn’t listen to the instructions about slowing down for the big turn at the far end of the track. I’ll never forget being behind him and watching him plow straight into the hay bales as he careened off the track. My terror quickly turned to relief and laughter as I saw him give the thumbs up signal. The track manager was not as enthused however as he had to drive down to get him back on the track. This summer’s experience included Alex and his Uncle John. You’ll get a kick out of John’s dress shoes having just run over from the office. It was also our first use of the GoPro camera for track racing. Unfortunately I had forgotten to charge the battery pack so it didn’t produce any footage but we still got some good shots with the hand held. You can reach the Action Karting at 303-781-4483 or on the web at http://www.actionkarting.net/. Other tracks in the Denver-metro area include: IMI Motorsports Complex, The Track at Centennial, SpeedRaceway, and Unser Racing. For more information contact Craig at craig@adventuredad.org. June in Denver is known for beautiful sunny mornings followed by late afternoon thunderstorms. When Alex was younger, we would go out on the sidewalk and float down a variety of sticks and plastic boats toward the canal by our house. He would run along with excitement and splash along as the rain came down. 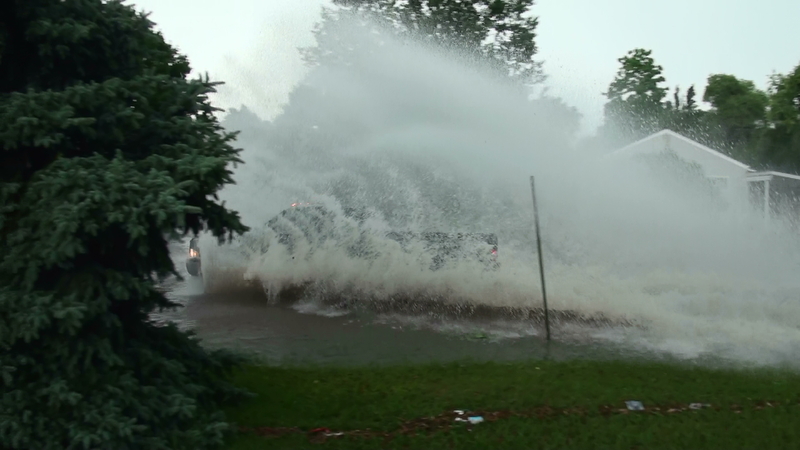 As a teenager with a truck, a whole new idea came to his mind as I was filming one of the biggest storms I’ve seen in 25 years of living here. As you’ll see on the clip, a very impromptu adventure came to life as the rain came down. I now see a boat in our future! There are many experiences in life that gives a child/teen a sense of freedom and increases the adventures available to them. Think about the thrill that comes with your first bike, as the wind whips through your hair (pre helmet days!). As the child becomes a teen, nothing symbolizes freedom like a driver’s license. Independence is the new norm as teens begin to experience the freedom and responsibility of driving. I can remember being so proud as I watched Alex get his license photo taken the day after his 16th birthday. This past weekend, a year and a half later, I got to watch and participate in Alex’s buying his first vehicle, a truck. The shopping and buying experience was another unique adventure for us and I got to feel like a needed dad and proud observer of independence at the same time. There were some great lessons here including his hours of research and fact finding (Carfax is great). Equally important was tempering the urge to jump at the first one to come along and push a little further in one’s search as we leaned on friends whose experiences could guide us. Also were the economic implications of working hard and saving money, deciding on a loan amount which he could handle, the reality of taxes and one’s first inspiration to have a political voice, and gas prices that were rising with each Google search. Ultimately, the desire to have a monster truck overruled the realities of future oil prices, and a deal was negotiated with the car dealership. As a dad, whose daily role of guidance and education is reduced with each passing day, the actual day of the car buying experience gave me a recollection of days past. I got to feel knowledgeable again in the details of shopping, what traps to avoid, and the process of negotiating and playing one’s cards right. In the end, I believe the three parties Alex, myself, and the dealer all felt satisfied. As you’ll see in the video, it’s possible that the salesmen had as much fun as we did! Given that it’s one big truck, we are expecting to have many great adventures with it. We will definitely be getting our “Groove” on as we load up and head out! For my friend Philippe and his daughter Harper, their daily adventure happens right in their own back yard! While we’ve never spent much time around chickens, it was fun watching the two of them care for their friends, collect the eggs, and learn some deeper lessons. We hope you enjoy their adventure! Going berry picking with Jimmy and Michael reminded me of the importance of patience, flexibility and having an AdventureDad mind set when you’re with your preschool child. Dealing with the changing desires and emotions of a preschooler as well as changes in your original plans requires a large measure of adaptability. It also reminded me of how working together with your hands can be a great way to bond and the perfect conditions for connecting emotionally. My son and I had several calming moments at Tim’s farm after 9/11 and several other difficult times in our lives. If you watch the whole clip, you’ll also meet a dad who followed his bliss into a new life! 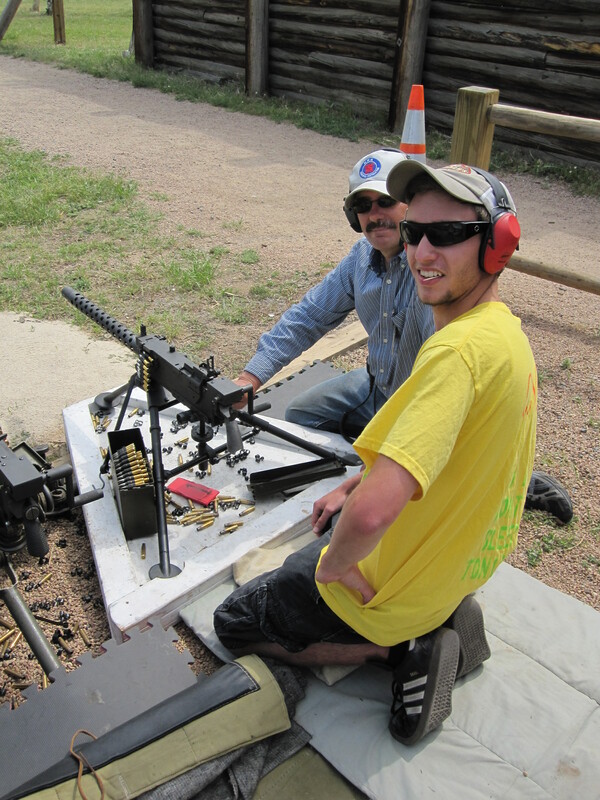 Some of my favorite memories and connecting points with my dad, and now my son, were when we went shooting. There are so many sights and sounds involved, all of which take me to a place of familiarity, relaxation, and joy. Not to mention the thrill of hitting the target or the even bigger thrill of watching your child hit their first target! 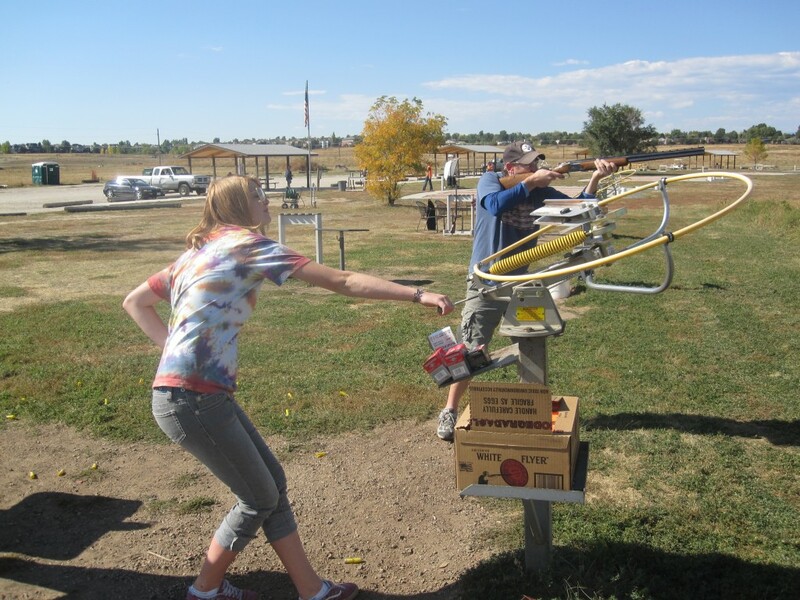 This past weekend, we had the joy of taking my friend T and his teen daughter Hjordis on a trap shooting adventure at the Family Shooting Center in Cherry Creek State Park just south of Denver. Being only her second experience with shooting trap, it was a great new adventure for the two of them. As such, you can watch the learning experience going on for Hjordis and her working through her initial frustrations and later successes. 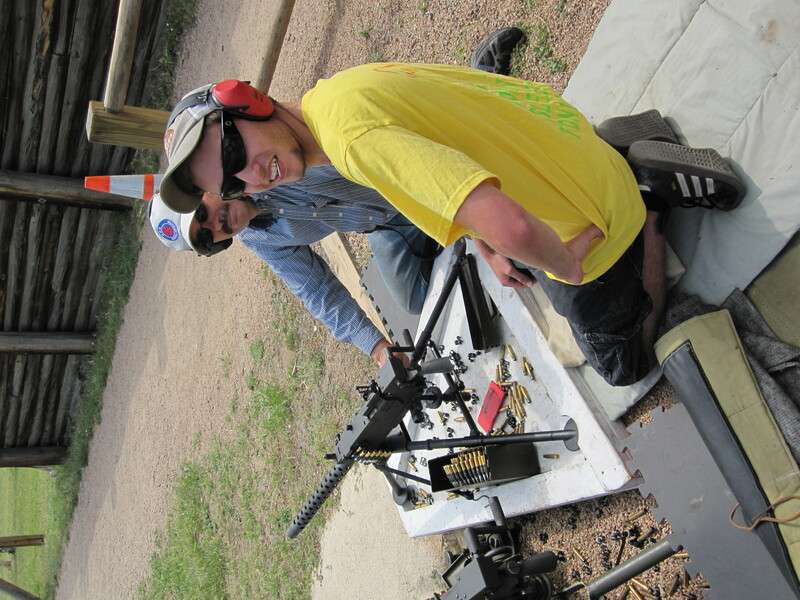 A public shooting center is a great place to learn if you are new to the sport. Everything you need can be rented. A staff of young people are available to help you with every aspect of the equipment and most importantly, safety. In the future, Alex and I are hoping to try sporting clays where you walk through a field and clays come flying out at different angles as you walk along. We’ve heard that it’s a big challenge and a whole lot of fun. Finally, in posting this adventure, we know that not all dads and moms are going to be comfortable with shooting guns and have strong ethical beliefs on such activities (especially with kids). In the future, I will be doing a longer piece in the Reflections section of AdventureDad.org on this topic. For now, I simply want to stress that gun sports begin and end with the safe and proper storage/use of weapons. Gun locks, vaults and no ammunition stored near guns are essential for your children’s safety and the safety of your child’s friends. Accidental gun shootings are still a major cause of death in children.